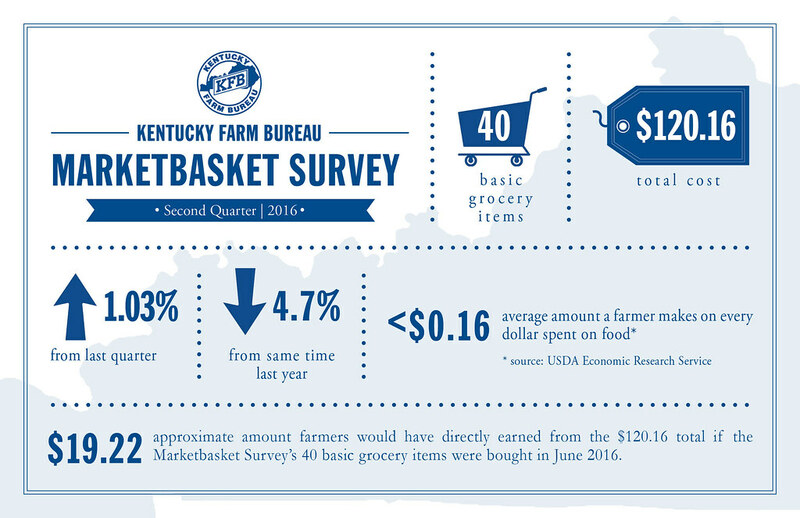 LOUISVILLE, Ky. (July 29, 2016) – For the first time in over a year, food prices in the Commonwealth have increased, according to the latest Kentucky Farm Bureau Marketbasket Survey, albeit a very slight increase for the second quarter of the year. The survey, taken quarterly and denotes the average total cost of 40 basic grocery items showed an increase of 1.03 percent. This is the first increase in food prices since the fourth quarter of 2014. Overall the cost of the items totaled an average of $120.16 as compared to the $118.92 recorded during the first quarter of 2016. The largest individual category increases came by way of dairy which rose in price by 5.4 percent followed by beef with a 2 percent jump. The largest decrease, category wise, was attributed to poultry which fell by 3.2 percent followed by fruits and vegetables which experienced a nearly 1.5 percent drop. Kentucky food prices increases were slightly higher than the latest national Consumer Price Index (CPI) information which indicated a 0.1 percent decline in overall national food prices during June. The CPI also denoted a 0.3 percent drop in the food at home index. Cheddar Cheese increased by $.87 per pound. Chuck Roast increased $.66 cents per pound, Rib-eye jumped by $.34 per pound. Extra-large eggs decreased by $.26 per dozen. Tomatoes dropped by $.50 per pound, and peppers fell by $.25 each. Whether or not U.S. grocery prices fluctuate from one quarterly survey to the next, Kentuckians and all Americans continue to enjoy some of the lowest food prices in the world. Shoppers in the U.S. spend only about 10 percent of their disposable income on food each year. Those costs remain far lower than any other country in the world thanks to many of the agricultural efficiencies utilized in America. Today the average U.S. farmer produces enough food and fiber to provide for about 154 people – a significant jump from an average of 19 people per farmer back in 1940. Yet while more food is now being produced on less land, the farmer’s share of the retail food dollar in America is down. According to the USDA’s Food Dollar Series, a farmer earns less than 16 cents per dollar spent on food, down significantly from the 31 cents earned in 1980.